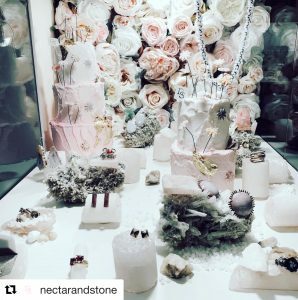 e.g.etal recently asked Melbourne’s dessert queen, Caroline Khoo, creative director of nectar and stone to choose her favourite jewellery pieces for a curated collection and installation in our gallery. The result is a magnificent pink-hued confection of crystal shards, milky minerals, sugary desserts and sparkling jewels. Arguably the sweetest moment ever at e.g.etal! My white glass neckpiece has been included and you can see it hanging in the back of this beautiful installation. See the nectar & stone installation at e.g.etal until 16th October, 2018.